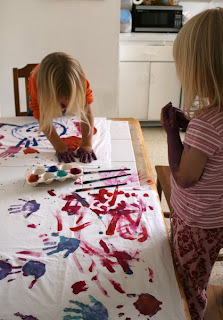 Filth Wizardry: Kiddy glue batik. Take Two. Kiddy glue batik. Take Two. 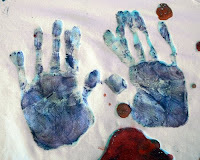 Well, we enjoyed the batik fun so much that the kids asked to do it again and this time I thought I'd try something a little different. 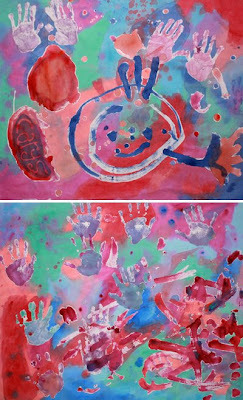 They seemed to enjoy the painting part far more than the glue part, so this time I let them paint a picture and put some handprints on the sheet with the watered down acrylics. 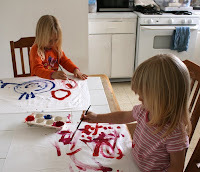 I washed the sheets and dried them, then when they were in bed and the sheets had dried, I covered their artwork with glue and that dried overnight. In the morning they painted all over the whole sheet, covering what they had painted before (but it was protected by the glue). We let the sheets dry again and washed off the glue and here's what we came out with. Below you can see the glue I put on over the initial painting. I love how wild and colourful they are and I love that now we have a dinky little memento of my older daughter's funny smiley face with stick arms out of the side of it's head drawing. By the way, she says the two blobs by it's side are a cave that it lives in and some food. That looks great! Also, your daughter's smiley face looks like a logo you can find if you look up "Blink 182 Smiley logo"